Three months ago, she had been excited. This was the opportunity she had been working toward since she joined the company three years ago. Meaningful work is one of the more joyous things you can experience. She didn’t want this job because of its prestige or high pay. She wanted this job because it was meaningful to her, her colleagues and clients. When I talked with her three months ago she was riding high. She explained that when she joined the company she had been hired for her skill set and outstanding success in her last assignment. But before she even joined the company she explained to the CEO that this was not her dream job. She would certainly do the job and do it well but in the end, she wanted a different assignment that was more meaningful to her. Over the three years, she did indeed do the job well. She built a great team and was recognized beyond her company as an outstanding contributor to the industry. And while she enjoyed the work and found great satisfaction in building and growing a great team, she continued to remind the CEO on an annual basis that she was still interested in the job that was more meaningful to her. And now she had it. She was filled with new energy and new excitement and explained all the things she wanted to accomplish in the new role. Many of them had never even been tried by the company. The breadth and depth of her vision were overwhelming when she explained all the things she wanted to build. I was wondering how any superhuman could possibly accomplish that much. But now! Have you ever seen a large hot air balloon being deflated? The beautiful, magnificent structure stories high into the sky with a buoyancy that leaves it hovering just above the earth defying gravity. But an instant later the entire structure has gone cold, collapsed to the ground with a heavy thud and lies there motionless and useless on the ground. That was what today’s phone call felt like. She had just come out of a budget meeting where it was clear the company was not going to meet next year’s goals and drastic cuts needed to be made. In an instant, her carefully crafted team and the multiple goals that had been hovering above the ground, ready for takeoff were now lying on the ground with no visible means of support. Deflated! Times of plenty can destroy one of the greatest assets of leadership teams: good decision making. We’ve discussed this in other blog posts, but the concept is always worth reinforcing. The word decide (de-cide) means figure out what to kill or stop doing. In times of plenty, leaders seldom have the spirit or inclination to say “no”. Good deciding means to be clear about what you’re saying “no” to. The other concept we began to talk about in her time of deflation was innovation and creativity. 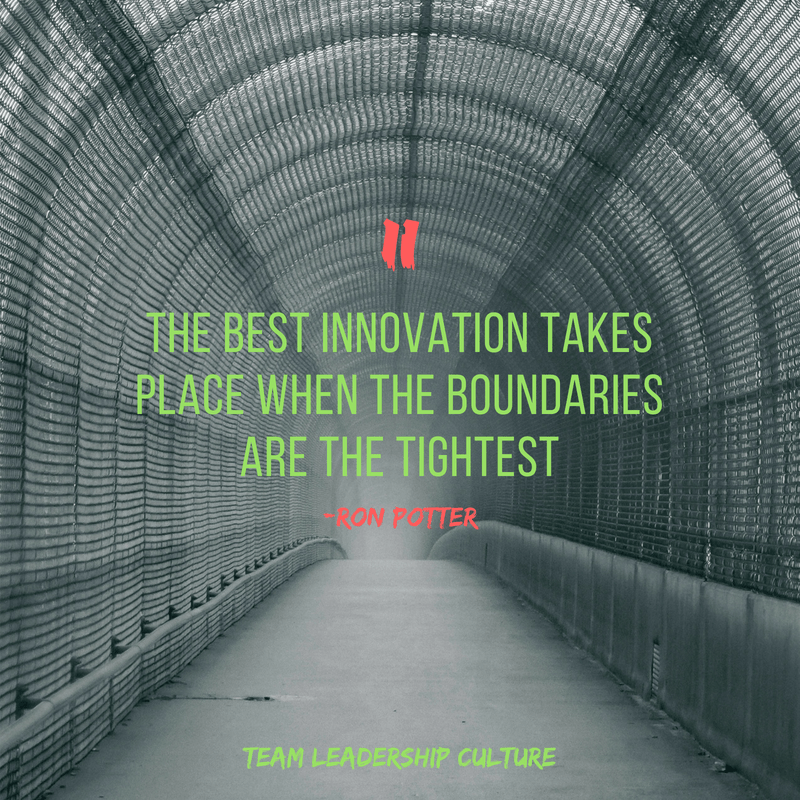 It has been well documented that the best innovation takes place when the boundaries are the tightest. Again, in times of plenty, it’s much easier to throw some ideas up on the board, try them all and see if any of them produce fruit. Not innovative! Innovation is about simplicity. Doing the most with the least. It’s those times when budget, time or resources are in extremely short supply when the best innovation happens. This was her time of opportunity. The budget was not just going to be tight, it was going to be slashed. She was going to be forced to say no to save that part that absolutely required a yes. And even the items that received the yes would need to be accomplished in the highest quality and the most elegantly simple way possible. Now was the time for true innovation. Have you figured out how to say no? Have you absolutely insisted that things get accomplish in the most elegant, simple form possible? At some point, you will likely be forced to accomplish those tasks. You might as well get started now. Learn to say no. Do everything as elegantly as possible. The Machines won’t stand a chance!